Church Edition Training Video | What's in the Bible? New to the What’s in the Bible? Church Edition, or want to learn more about how it works? Watch this Volunteer Training Video to see how each week of the curriculum works – what’s included, how to use it, and helpful tips for customizing it for your church! What’s in the Bible? creator Phil Vischer explains the vision and values behind the What’s in the Bible? Church Edition. This video is perfect to share with all of the leaders in your children’s ministry to prepare them to lead their classes through the What’s in the Bible? Church Edition. 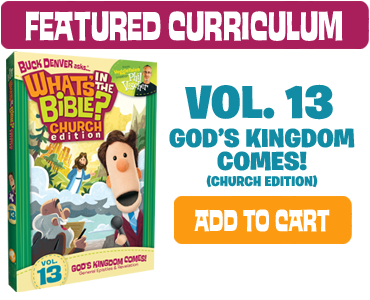 If you are looking for more information, check out the About Our Curriculum page, the What’s in the Bible? Church Edition Scope & Sequence, and our Frequently Asked Questions page. Want to know more? Join What’s in the Bible? director of content Melanie Rainer as she goes more in-depth about the What’s in the Bible? Church Edition, highlighting key features and benefits of the curriculum.